Dynaudio combines its hallmark sound with DSP convenience, which should appeal to multi-channel users. Easy set up and ﬂexible options. Dynaudio's classic uncoloured sound. Scalable system for multi-channel. 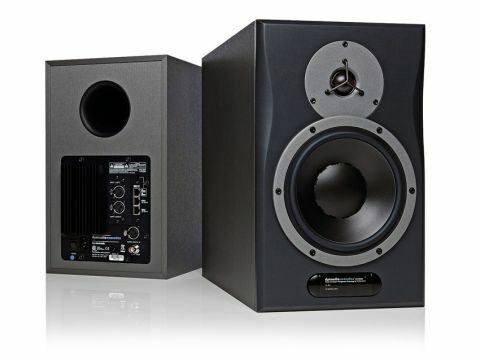 Dynaudio's active BM series monitors have been a mainstay of many engineering professionals for some time. So when the company hooked up with TC Electronic, it came as no surprise that the result was a DSP-equipped monitor along similar lines. Now, a few years down the line, the range has gradually grown, with the latest addition being the AIR 12. Like all monitors in the series you purchase a combination of 'master' and 'slave' units to match your needs. All audio connections (analogue or digital) are made to the master and this then connects to the slave satellites via the Ethernet-based TC Link system. Obviously, you could simply have a stereo pair (master and slave) as we have for review here, but more complex surround options will require combinations of multiple master and slave units. In addition, there are also various AIR-equipped subwoofers and the hardware AIR REMOTE. On the software front, the master unit gives you control over settings ranging from simple bass management such as low frequency roll off, to bass and treble adjustment (+/- 6dB), individual speaker levels, input sensitivity and overall volume. You also get various position compensation options, including wall, console and so on. "Like all monitors in the series you purchase a combination of 'master' and 'slave' units to match your needs." These functions are replicated in the AIR Soft application for Mac or PC. Unfortunately, this is a pay-for extra requiring a special lead. Finally, there's also a PC-only package called PC-IP that adds even more advanced parameter editing, again at extra cost. The AIR 12 is a rear-ported two-way design built around an 8-inch woofer and 1.1-inch soft dome tweeter. Each driver gets a 200W amp, and peak SPL for a pair is a healthy 128dB. Analogue inputs are on XLRs, with digital connectivity in AES/EDU format (also on XLR) accompanied by a Word Clock input. As standard, sample rates go up to 96kHz, but you can replace the analogue inputs with an optional digital expansion card giving you multi-channel digital connectivity and 192kHz capability using Dual Wire. Out of the box the AIR 12 is a big, heavy monitor (almost 15 inches deep and 13 kilos). Hook up is simple enough and the onboard LCD menu system easy to navigate. As long as you can easily reach the 'master' monitor, using them as we did without any additional software or hardware control is straightforward. In a multi-channel set up you'd probably want the software option. Sonically, like previous Dynaudio monitors, the AIR 12 delivers a solid uncoloured sound. The 8-inch woofer and ported design provides plenty of usable low frequency extension and if you fancy making tweaks you've got 6dB of shelving cut or boost at 100Hz and 5kHz. Like many quality monitors, we found the AIR 12 sounded excellent in its flat setting, but if your monitoring space is a little quirky, the EQ would certainly help. Alternatively, you could go for one of the pre-programmed correction options. We found both the wall and corner settings compensated by cutting low frequencies, but it's possible there were other things going on too. Either way, they're an instant fix. Overall, the AIR 12 is a very capable and flexible monitor that combines Dynaudio's trademark sound with the flexibility of a DSP-driven design. However, other manufacturers (Equator springs to mind) are now pushing the DSP boundaries much further, making the competition for Dynaudio tougher.